This entry was posted on December 15, 2010 at 10:23 am and is filed under Uncategorized. You can follow any responses to this entry through the RSS 2.0 feed. You can leave a response, or trackback from your own site. Beautiful. The underwater patterns are fascinating and sure make for a great photograph. Love the glassy reflection combined with the salt patterns. Wonderful image Steve! You done it again with this one, Steve. Great work! Thank you guys, I really appreciate you stopping by! Dittos – wonderful image. One of those you have to look at several times to comprehend what it is exactly that you are looking at. Amazing Steve… I will have to return when there’s water there some day. Nice to see you posting, Steve! Absolutely stunning shot! What a nice image Steve. 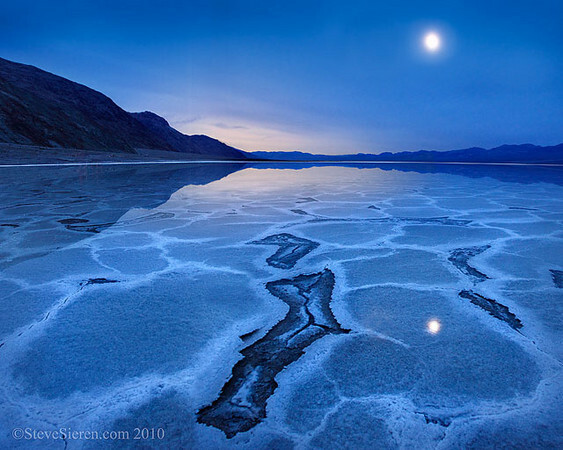 the water, moon, and gteh submerged ridges of the salt ….beautiful image…. Thanks Rhoda, Derrick, and Steve! If this rain keeps up you’re going to see it again! This time I’m going to make it a point to go kayaking no matter what. Catch it while it’s wet!